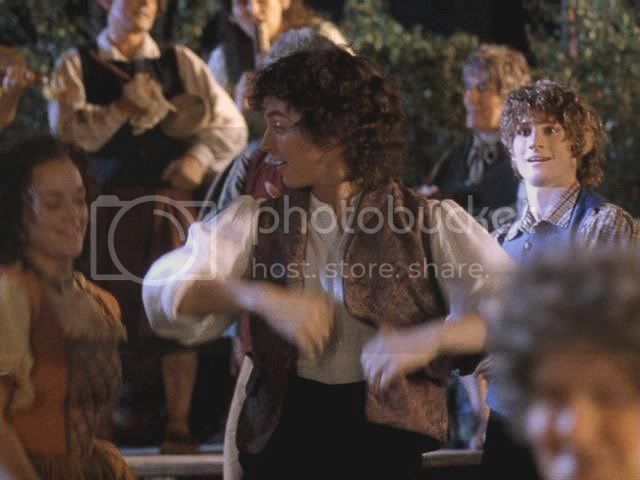 I am including caps of this sequence simply because they are the best (most focussed and best lit) caps I could glean from all the Frodo dance sequences. 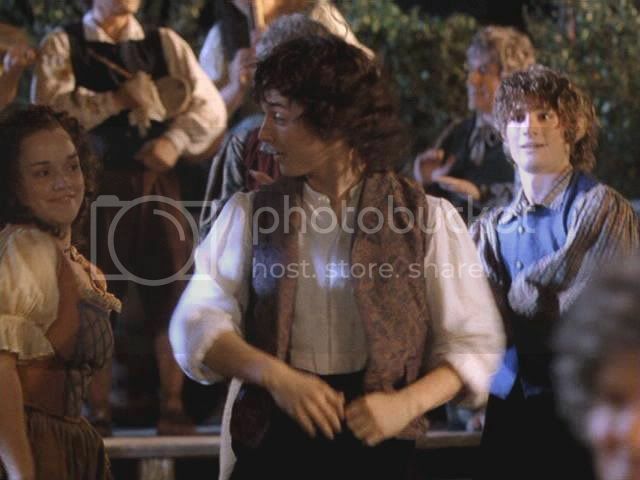 In this brief series, Frodo acquits himself well as a spirited performer of partner dancing. 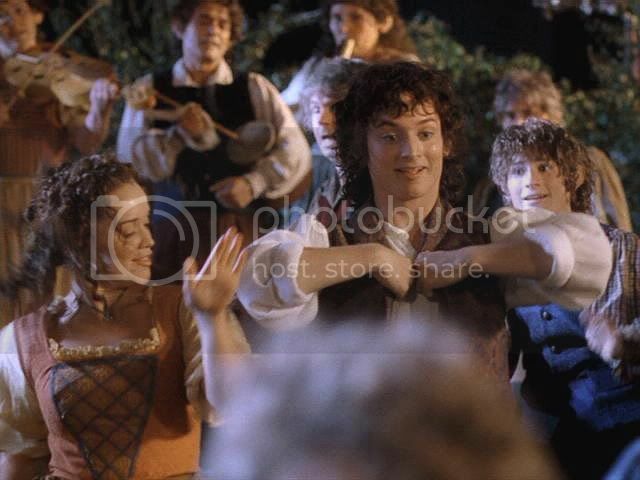 Bravo, Elijah Wood for doing such an enthusiastic job in a dance scene that barely made it into the theatrical release. 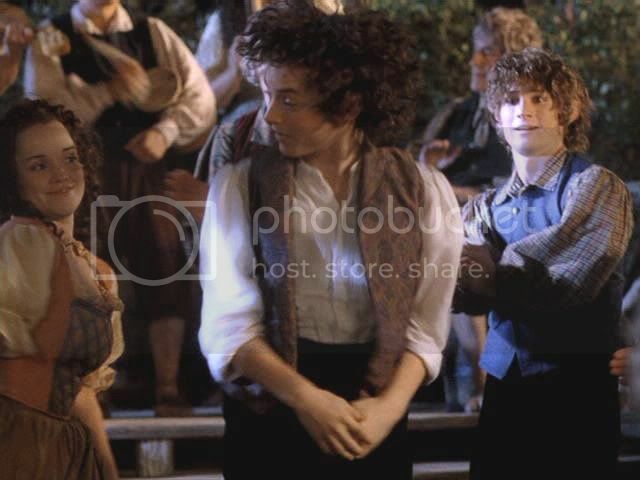 Heavens, what a lovely hobbit! 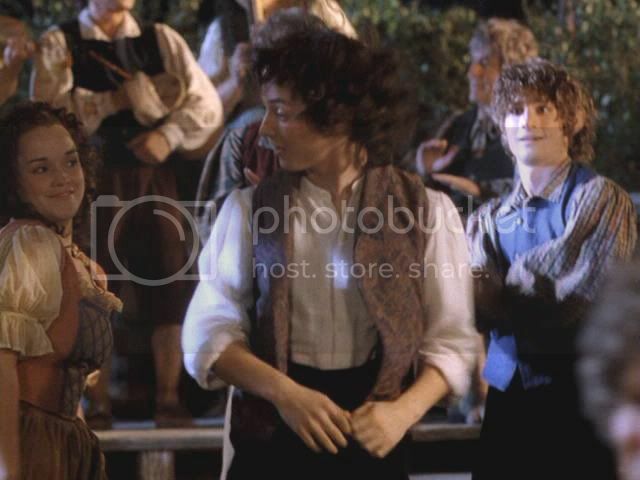 It's that cute little hobbit-bint giving him the eye who cracks ME up. That is the "funky chicken" dance? I thought it was standard male-female folkdance fare. But, no, this sort of folk dance does feature a good bit of bird-courting behaviour. The hen just stands there with a bright eye and a saucy tilt to her beak, puffs her breast feathers and flips her "skirts" in an invitational manner. The male struts and capers about for her, puffs out his cheeks and flaps his wings, hoping to win her favour. I suppose that's what all those "funky chickens" are doing. I believe this cap ends with Frodo clasping his waistcoat lapels, a movement which resembles the chikcen-wing lifting of the elbows. But it is a very standard "guy" posture in country dances. Well, in U.S. ones, anyway. Cowboy dances have the men do that a lot. Yes, his partner definitely has the "Pearl Took" look we have seen before, right in your icon (from the painting of the lass with the beautiful Frodo-ish lad on the swing). They aren't the real characters? I have loved that "cute little hobbit-bint" for ages. Sigh; that is so me! 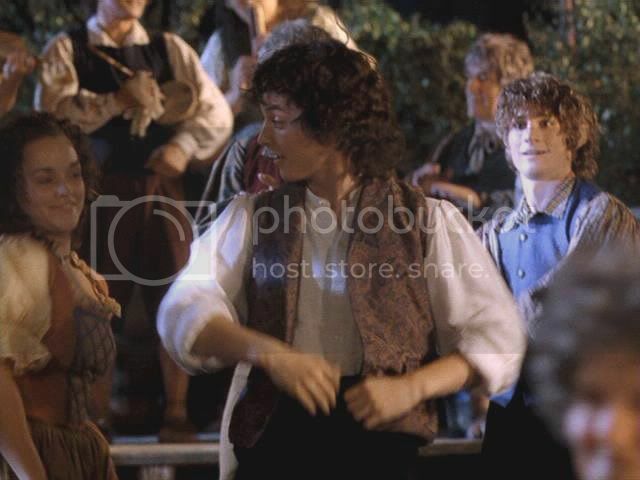 im not sure who lorn is but can anyone tell me who the actress is doing chicken dance with frodo. my brother thinks he may know her.waiting to see if anyone on this site can answer this question.